We also speak with another leader in the climate movement--Michael Brune. The Executive Director of The Sierra Club joins us with his thoughts on where we need to go next. Senator Tom Udall joins us, virtually via video, with his moving comments on how climate change is impacting his state of New Mexico. Udall's speech was made during last week's dramatic overnight session in the senate, one of a few dozen given on the climate crisis. Linda Marsa, scientist and author of "Fevered: Why A Hotter Planet Will Hurt Our Health and How We Can Save Ourselves" shares how unabated climate damage will have an adverse impact on everything from dengue fever to depression. Our first guest is an unlikely "fractivist"...Lou Allstadt is a longtime former Executive Vice President of Mobil Oil and he shares the roots of his post-career activism and what led him to write an angry open letter to Exxon head Rex Tillerson. Noted environmental writer for the New Yorker and author of three books, Elizabeth Kolbert talks abput her latest work..."The Sixth Extinction, An Unnatural History". She discusses what humans are doing, knowingly or otherwise, to doom life on our blue planet. Despite the Obama administration’s insistence that natural gas must be a part of United States energy policy, it’s increasingly clear that natural gas is not all that it’s “fracked” up to be–and that it has already inflicted harm upon communities, our country, and climate. Jim Morris of the Center for Public Integrity discusses a new report on how the fracking industry has messed with, and messed up, Texas. Doug Grandt: "Write to Rex, Write Away!" Human-caused climate change will be calamitous for many--and extremely profitable for a few. McKenzie Funk's new book "Windfall, The booming business of global warming" examines the interests that stand to cash in on the consequences of carbon. As the world tunes in to the summery Winter Games at Sochi, author and skier Porter Fox discusses the threat climate chaos poses to the ski industry, winter sports, and even the Olympics themselves. Slushy conditions already affecting athletes results in Russia. From snow boarding to snow hoarding--what does it portend? History may record Republican operative and Fox News Channel head Roger Ailes as being every bit as darkly effective as Charles and David Koch in terms of twisting the American political system in order to block needed action on human-caused climate change. Gabriel Sherman, author of "The Loudest Voice in the Room," discusses the legacy of the man who dispensed the dialogue of denial to millions of TV and radio listeners. And all in the name of "entertainment" , environment be damned (says Betsy!). Ryan Cooper & Evan McMorris-Santoro: How President Obama plans to put more power behind his push for environmental action. Ryan Cooper of the Washington Monthly and Evan McMorris-Santoro of Buzzfeed discuss the growing grassroots effort to compel President Obama to take the moral high ground on whether or not to under ground the Keystone XL pipeline. Longtime conservationist, Brock Evans discusses his newly released book, “Fight & WIN…Strategies For The New Eco-Warrior”. After some 50 years in the trenches Evans shares his wisdom on winning the most noble battles of all. While much of the Northeast is once again stuck in a polar vortex, mainstream media entities are stuck in a tunnel of NOT connecting the weather dots— the Republican Party is spinning in a vortex of denial.Why? We get answers from Salon assistant editor Lindsay Abrams and Brigham Young University geochemistry professor Barry Bickmore. Just how concerned are the scientists at Union of Concerned Scientists about the state of our environment? We talk to senior climate scientist at UCS, Brenda Ekwurzel, as well as UCS spokesman, Aaron Huertas about a warming planet, polar vortex' and weird weather, oh my! Hear about the other scandal Chris Christie doesn't want to talk about--the impact of the New Jersey Governor's pulling his state out of a successful Regional Greenhouse Gas Initiative. Doug O-Malley, Director of Environment New Jersey weighs in on the other controversial Christie move. Is the cold snap, deep freeze, polar vortex or whatever you want to call it that gripped much of the nation this week connected to climate change or does it mean "global warming" is not a real threat? We'll "drill down" for the facts with Daniel Weiss, Senior Climate Fellow at The Center for American Progress. Weiss also gives us a preview of what his former boss, John Podesta, is likely to do in his new role as advisor to President Obama. One of the big names in both climate science and academia joins us to discuss where things are as we close out 2013. Kerry Emanuel, on sabbatical from MIT as professor of atmospheric science, shares his views of the political and media climate around global warming, as well as the need to protect against its potentially catastrophic effects. From our atmosphere to wetlands under siege in the southern U.S. Scot Quaranda, Campaign Director for The Dogwood Alliance, weighs in on the widening practice of burning trees for energy and their newly released mini-doc, “Wetlands Up in Smoke”. We are sawing off the limb we're sitting on". That quote from futurist Paul Erlich, just one of many dramatic comments in the new film, Call of Life. The 6th great extinction is upon us and yet most Americans remain in the dark about this and other challenges to our life support system on earth. Director,Monte Thompson talks about the making of this important film and it's urgent message to humanity. Professor Michael Kraft of the Department of Public & Environmental Affairs at the University of Wisconson Green Bay talks about what prompted him to go out on a limb demanding congress pass more comprehensive climate legislation. We get a first hand account of COP19 from Robert Stavins, Harvard's professor of Business and Government at the Kennedy School. As the Director of Environmental Economics, Dr. Robert Stavins has attended many of the UN climate conferences -- he shares some optimism about what happened...and didn't...in Warsaw. Politico's Environment and Energy Reporter, Darren Goode, talks on his article about conservatives and green groups coming together for common causes, even if driven by different motivators. Matt Russell, Food Policy Project Coordinator at Drake University, explains why his state's extreme weather should be EVERYONE'S CONCERN! Richard Heede, of the Climate Accountability Institute, talks about the first-ever report quantifying where our emissions have come from over the past 100 years or so. Among the findings...just 90 companies are responsible for nearly two-thirds of our greenhouse gases! Ralph Cavanagh, the NRDC's Co-director of Energy discusses CNN's recent documentary, "Pandora's Promise" on the benefits of nuclear power. We discuss what was omitted in that program and why. One of the leading economists in the U.S., Dr. Jeffrey Sachs, joins us to interpret the latest monster storms and what they portend. The Director of Columbia’s Earth Institute says the time has come to take the climate seriously, beginning with our government and the mainstream media. Salon writer, Sean McElwee, discusses his recent article which makes the case–once and for all–that Republicans ARE indeed the anti-science party! In acknowledgement and honor of the thousands of victims of Typhoon Haiyan–a “hellstorm” that may go down as the biggest storm ever recorded– we air, in it’s entirety, a moving speech by Naderev Yeb Saño, delivered to COP19 delegates gathered in Warsaw,Poland for the U.N Conference of Parties. In it you’ll hear the Philippines Envoy beg his fellow representatives for substantive action on climate change as well as announce his hunger strike until there IS movement on the growing crisis. Fred Horch talks about how to brighten solar’s prospect’s in his home state of Maine. 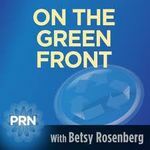 The legislative policy analyst for Maine’s Independent Green Party discusses a novel new approach to making solar power more affordable to residents. Reverend Fred Small is a BIG force in the religious environmental community. The senior minister at the Unitarian Universalist Church in Cambridge, Massachusetts shares his views on climate activism, the Koch Brothers and some of the spiritual questions raised by the reality of what we’re doing to our life support systems. After the Super Storm that forever changed the New Jersey/New York coastline –as well as many minds– what have we learned from the “1 in 100 year” event? Dr. Radley Horton, a climate scientist from Columbia University and Nasa’s Goddard Space Institute, says we should expect more of the same in the near future. Silicon Valley businesswoman turned anti-plastic advocate Daniella Dimitrova Russo shares “must know” information about the role of plastic in our lives…and beyond! As we approach the first anniversary of Sandy, the super storm that signaled arrival of climate change for many Americans, we'll talk to Senator Rob Hogg of Iowa to hear about commemoration events happening in his area and around the country -- including plans for a walk across the nation next year. Hear what makes Senator Hogg optimistic about our climate future thanks to grassroots grit and people power. Yes, even WITH all the grid-lock and goofiness in Washington! One of the world's leading climate scientists, Dr. Michael Mann, joins us to discuss results of the new IPCC report and what it portends. He also discusses the merits of the divestiture movement led by author and activist Bill McKibben. D.R. Tucker also checks in from an anti-Koch Industries rally outside a broadcast station in Boston.